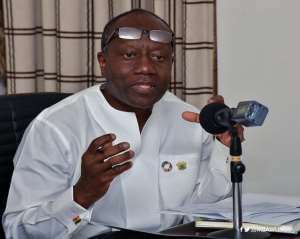 The Finance Minister Ken Ofori-Atta has revealed that the government will constitute a bi-partisan committee to probe the recent depreciation of the cedi and suggest measures to curb it. The Minister’s statement comes after the cedi recently hit an all-time low recording a rate of GHS5.86 to a $1. However, the local currency which was described by Bloomberg as the weakest currency in Africa started picking up after the sale of the $3bn Eurobond by the government. But according to Mr. Ofori-Atta, drop in the cedi was not due to the weak fundamentals of the economy stating that the fundamentals of Ghana’s economy are strong enough to support economic growth. “The turbulence happened despite the strong economic fundamentals and improvement in our balance of payment which our government has achieved in the last two years. We have done a lot of work to ensure that the economic fundamentals are robust and able to support economic growth and transformation. “This is further evident, for example, in the following statistics: inflation declining from 15.4 per cent in 2016 to 9.2 per cent in 2018; fiscal deficit falling from 6.5 per cent in 2016 to 3.9 per cent in 2018; interest rate on 91-day treasury bills was 16.3 per cent in 2016 to 14.6 in 2018; the current account deficit from 6.6 per cent in 2016 to 3.2 per cent in 2018”. Mr. Ofori-Atta added that “In 2012, the cedi depreciated by 15.95 per cent, 12.81 per cent in 2013, peaked at 32.45 per cent in 2014, up to 15.68 per cent 2015 and depreciated in 9.65 per cent in 2016. “The cumulative depreciation from 2012 to 2016 was 65.423 per cent. Between December 2017 through the whole of 2018 [and] 21 March 2019, the cedi has depreciated by some 17.32 per cent compared to 25 per cent in 2015 and 2016.